Each year at AirVenture more than 150 VAA volunteers manage over a mile of the EAA flight line and more than 100 rows of showplanes from show center all the way to the very south end of Whitman Field. 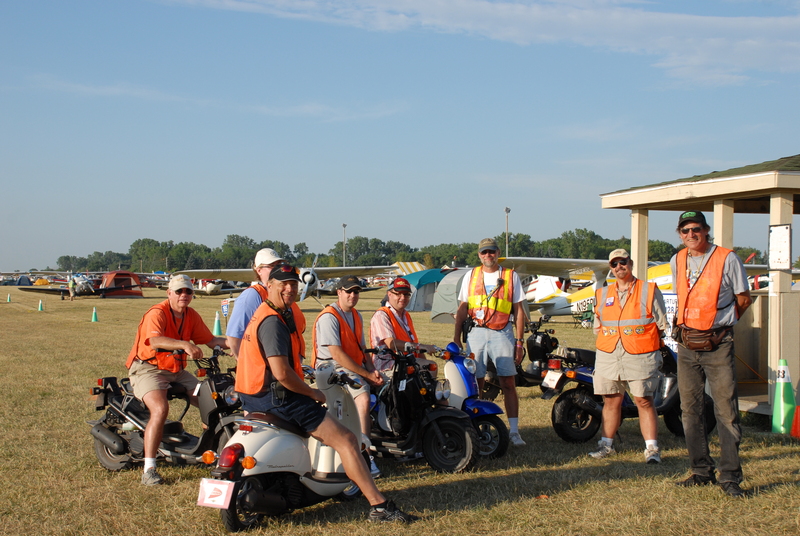 Our volunteers range from visitors who serve an hour or two on their one-day visit to AirVenture to dedicated individuals who often arrive a week or two early to prepare the site, park airplanes, and generally have a great time working every day. If you truly want to experience the “family” that is Vintage, the only way is to become a volunteer. We have jobs for all ages, all levels of experience, and as much time as you care to give. Some volunteers contribute over 200 hours per year and our average volunteer contributes 49 hours. GREAT VOLUNTEER JOBS for GREAT VOLUNTEERS!! No matter what you volunteer to do with Vintage, we WELCOME you!! The best part of volunteering is meeting people from all over, telling and listening to flying stories, seeing fabulous aircraft…and just having a great time! We would LOVE to have you join us…for a few hours, or a few days! Crosswalk Guards: With their own private “building”, these guards are brave, loud and confident! With aircraft moving around, vehicles on the road and people taking in the fascinating sights, these folks are CRITICAL in preventing unwelcome prop encounters! Supplied with a folding chair, a bit of shade, AND a lovely stop sign, this is a VERY important position! 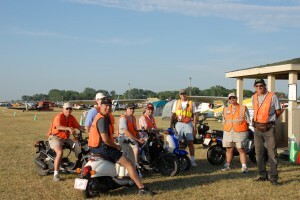 Bikers: Ever wanted to tell someone you spent your time at Oshkosh not just watching airplanes, but parking them? 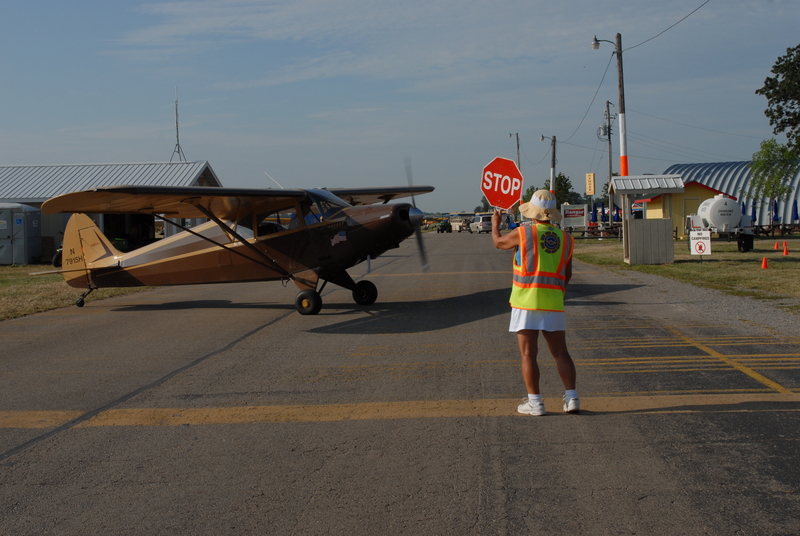 Yup, they do not park themselves…so, join me for some training and park all the airplanes you want! **BONUS: get a chance to see some AMAZING one-of-a-kind VINTAGE aircraft…and meet some pretty spectacular pilots and volunteers as well!! Operations: Work well with others? Our operations staff juggle several things at once! They handle the radio calls and use the computer to “bell ring” aircraft to verify that they qualify to park in our area. They check the volunteers in and out, assign scooters, vests, keep track of shifts, and answer questions! They could easily add a LOT more to this list! Come on down and enjoy some shade and one HOPPING good time! (Did I mention that the windows face the flight line?!) Click on the video at the top left of this page to experience life in the Ops building. 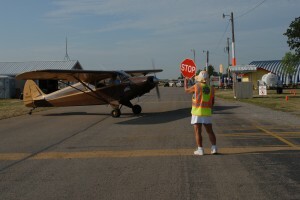 Flight Line Safety: We are always looking for people to help us on foot. 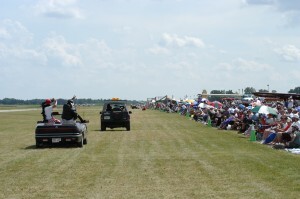 Help with crowd control during the airshow, protect aircraft, and have a GREAT view of the airshow! It’s easy to join us! Sign in at the Vintage Volunteer Center located on the flight line east of The Red Barn. Age restrictions do apply in some areas due to state law and insurance restrictions. Interested? Contact Patty Dorlac at Antiqueflash1 (at) gmail (dot) com with any questions!